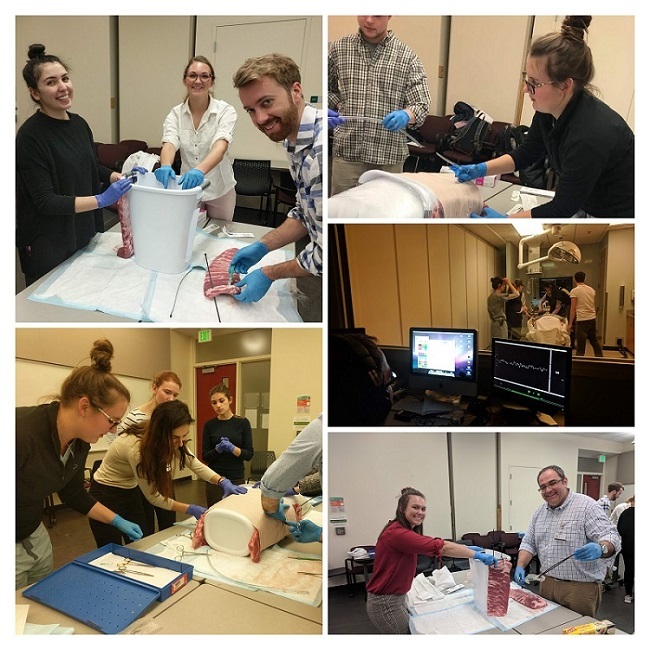 The Emergency Medicine Interest Group at the Wayne State University School of Medicine hosted its yearly "Skills Night" on Jan. 24, bringing together 70 first-, second- and third-year medical students to learn and practice skills used every day in the emergency department. "This year we were lucky enough to have emergency medicine attending physicians and residents from both Detroit Receiving Hospital and Henry Ford Hospital, as well as some experienced (Year 4 students) who are going into Emergency Medicine handpicked by our faculty adviser, (Assistant Professor) Sarkis Kouyoumjian, M.D.," said Class of 2022 student and EM interest group member Chris Merriman. Stations included splinting, suturing, intubation, a full code, lumbar puncture, ultrasound guided IVs, intraosseous needle placement and a chest tube station designed by Dr. Kouyoumjian. "In addition to practicing these skills, we also were very lucky to interact with the residents and ask them questions about the field of Emergency Medicine in between stations. Overall, this event was a huge success, leaving the medical students excited about future EMIG events and the field of Emergency Medicine," Merriman said.